What is Heart Smart about? Heart Smart is targeted at people who are recovering from heart problems or heart surgery. 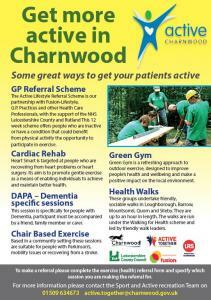 Its aim is to promote gentle exercise as a means of enabling individuals to achieve and maintain better health. A variety of activity programmes are available including gym sessions in a fitness suite, gentle circuits class in the dance studio, walking, diet and nutrition advice and stress management sessions. The sessions also provide a regular support and social group for participants. There is a great deal of evidence to support the key role that physical activity plays in improving the quality of life and the health and well being of people who have been diagnosed with Coronary Heart Disease (CHD). If you live in Charnwood Borough and have suffered from or have any of the following, you can be accepted onto the Heart Smart Scheme. Individuals must have completed the 'Phase 3' Cardiac Rehabilitation programme within the last three months, at one of the three University Hospitals in Leicester. If you are eligible the Cardiac Rehabilitation staff will complete a Phase IV referral form for you, which will be sent to our Cardiac Rehabilitation Officer. If you have been diagnosed with Coronary Heart Disease (CHD), and meet the eligibility criteria contact your GP or Practice Nurse. If appropriate they will complete a Heart Smart Exercise Referral Form, which will be sent to our Cardiac Rehabilitation Officer. On receipt of your Phase IV referral form / Heart Smart Exercise Referral form, the Cardiac Rehabilitation Officer will contact you to arrange an induction. At present only selected GP Practices from North/South Charnwood are involved with the Heart Smart Scheme. When their referral period has finished they are encouraged to join the Fitness Suite at Loughborough Leisure Centre, Soar Valley Leisure Centre at Mountsorrel or South Charnwood Leisure Centre at Syston. For full details please visit the Fusion Lifestyle website.